I received some rib material with the top and back I purchased Orcas Island but after working with it for awhile I decided to try some different wood. The second set of ribs I ordered from Bruce Harvey Rocky Mountain Tonewood. 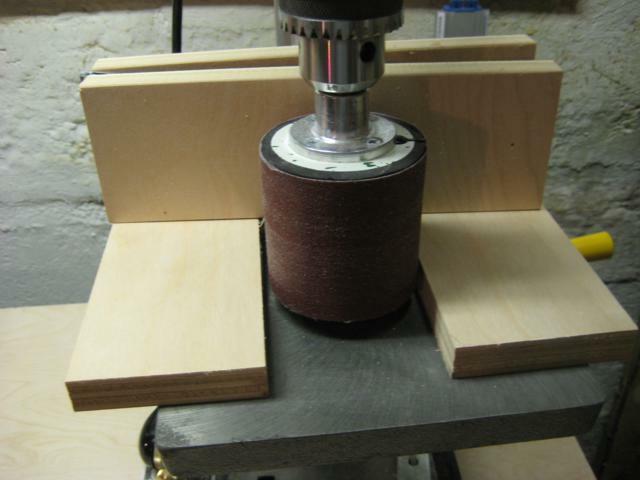 This set was much easier to work with and started out trimmed down to a manageable size. 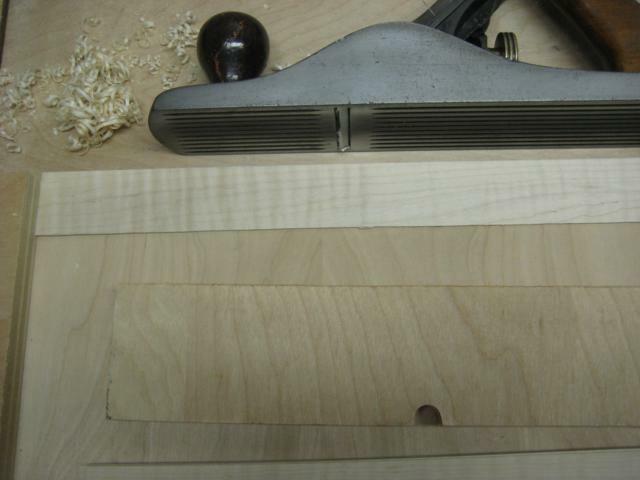 First, I used a shooting board and planed down one edge of the ribs. I then trimmed the ribs closer to the correct width on the bandsaw and then went back to the shooting board to clean up the edge cut by the bandsaw. 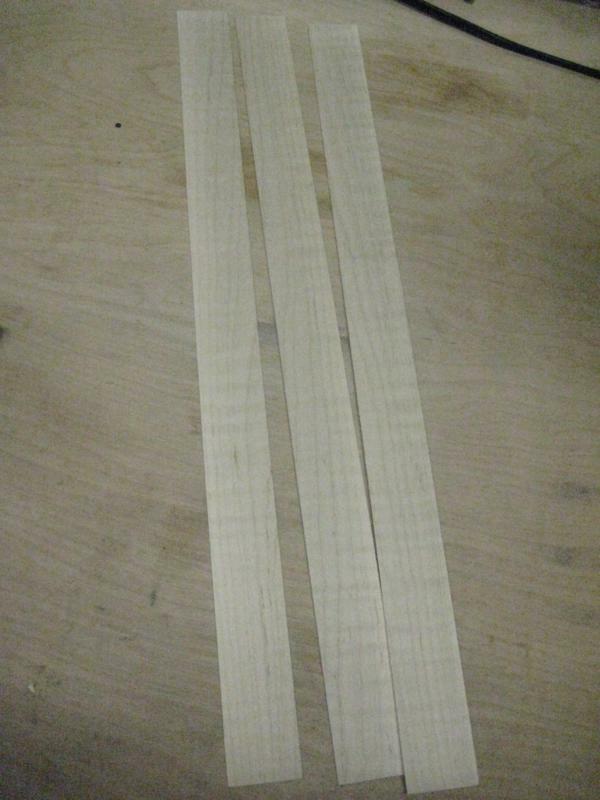 Now I have to thickness the ribs to get them down to around 1-1.2mm. The Strobel book recommends 1mm but the Roy & Courtnall book recommends 1.2mm. The diplomat that I am I went with 1.1mm. The ribs started out around 2mm, so to first get them down to size I used a little thickness sander jig I made for my drill press. 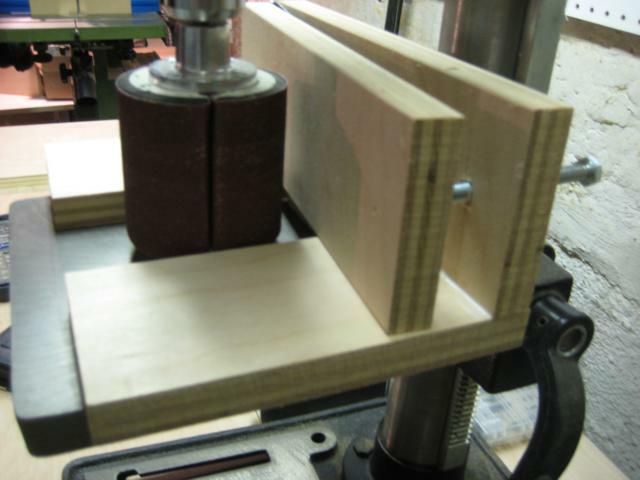 Each time I turn the bolt in the back it reduces the gap between the drum and the support. Again changing the sandpaper on the drum made a huge difference. This process was quite tedious and not very enjoyable since I had to have my shop vac running to keep the drum clean and collect all the dust. Next time I plan to get a toothed bladed or grind a special bevel on my block plane and do it by hand. After thicknessing on the drill press the ribs were around 1.4mm, but the surfaces were very rough from the 80 grit sandpaper. To get a nice surface on the ribs I used a card scraper and reduced them to their final thickness of 1.1mm. 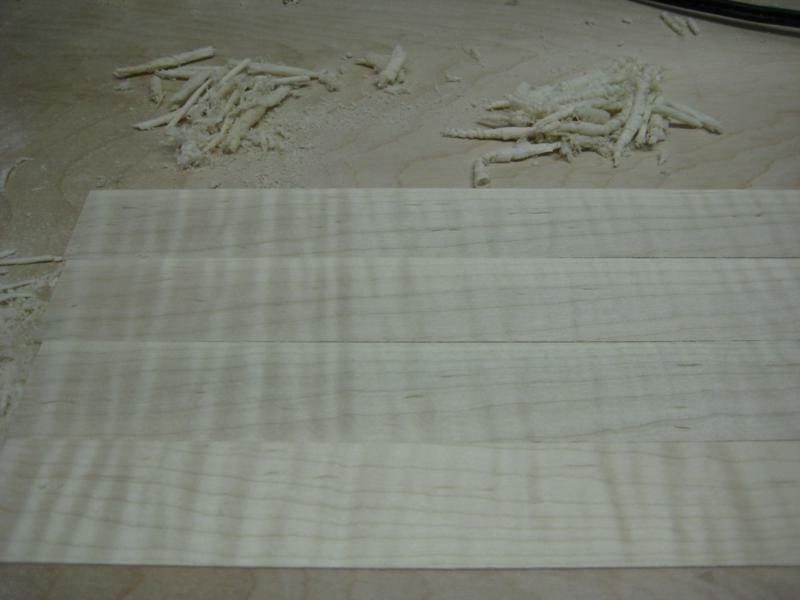 As you can see below, scraping really puts a nice finish on the ribs and brings out the “flame”.